It’s been a while since I posted about this project… I haven’t had time to do many changes, just maintaining the current system as it is keeps me busy. One thing I noticed is that I started getting poor performance out of the solar system late last week. This was about the time that Sydney was getting the dust storms from Broken Hill. Now, being in Brisbane, I didn’t think that this was the cause, and the days were largely clear, I was a bit miffed why I was getting such poor performance. When I checked on the solar system itself on Sunday, I was getting mixed messages looking at the LEDs on the Redarc BCDC-1225. I thought it was actually playing up, so I tried switching over to the other solar controller to see if that was better (even if I know it’s crap), but same thing. Neither was charging, yet I had a full 20V available at the solar terminals. It was a clear day, I couldn’t make sense of it. On a whim, I checked the fuses on the panels. All fuses were intact, but one fuse holder had melted! The fuse holders are these ones from Jaycar. 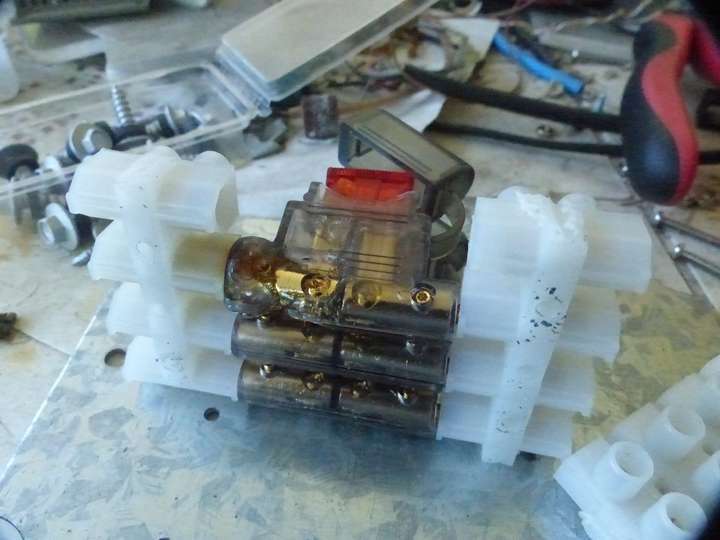 10A fuses were installed, and they were connected to the terminal blocks using a ~20mm long length of stranded wire about 6mm thick! This should not have gotten hot. 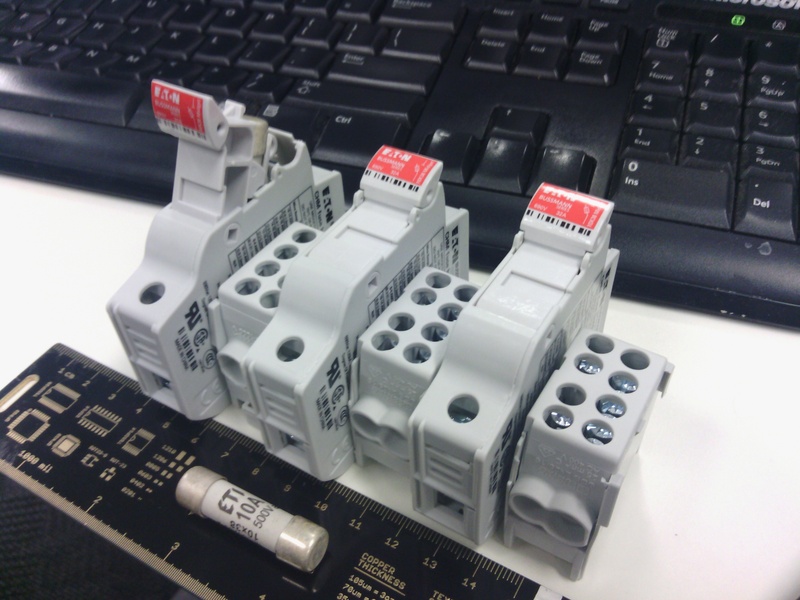 I looked around on Mouser/RS/Element14, and came up with an order for 3 of these DIN-rail mounted fuse holders, some terminal blocks, and some 10A “midget” fuses. 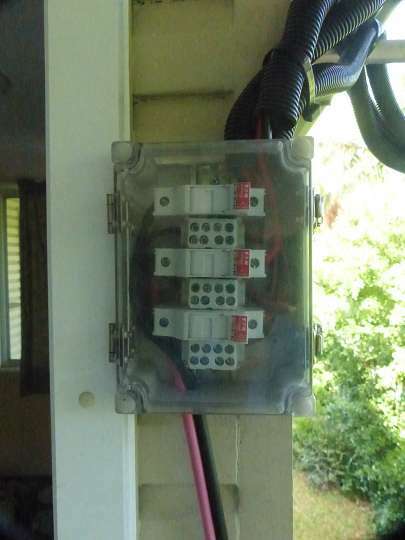 I figured I’d install these one evening (when the solar was not live). 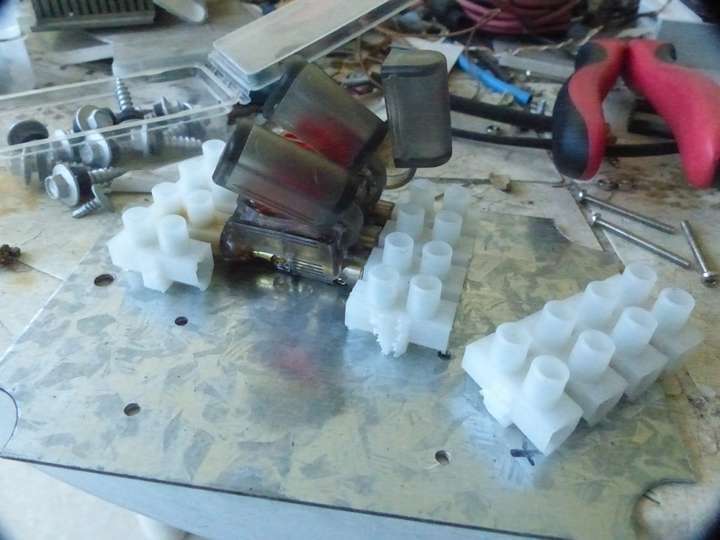 New fuse holders, terminal blocks, and fuses. However, it was yesterday morning whilst I was having breakfast, I could hear a smoke alarm going off. At first I didn’t twig to it being our smoke alarm. I wandered downstairs and caught a whiff of something. Not silicon, thankfully, but something had burned, and the smoke alarm above the cluster was going berserk. 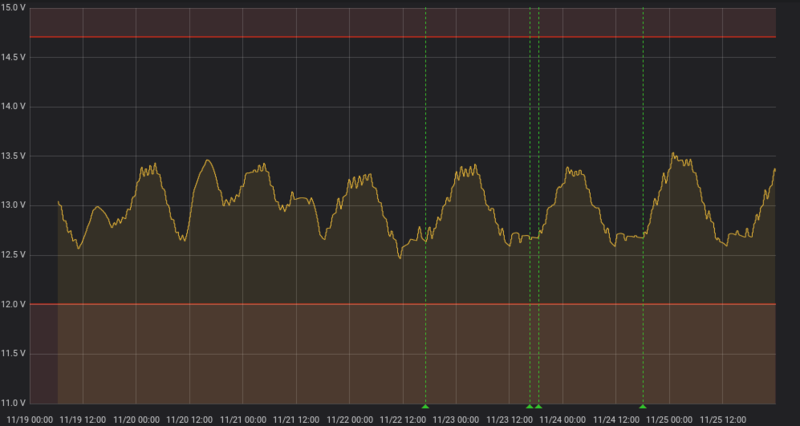 I took that alarm down off the wall and shoved it it under a doonah to muffle it (seems they don’t test the functionality of the “hush” button on these things), switched the mains off and yanked the solar power. Checking the cluster, all nodes were up, the switches were both on, there didn’t seem to be anything wrong there. The cluster itself was fine, running happily. My power controller was off, at first I thought this odd. Maybe something burned out there, perhaps the 5V LDO? A few wires sprang out of the terminal blocks. A frequent annoyance, as the terminal blocks were not designed for CAT5e-sized wire. By chance, I happened to run my hand along the sense cable (the unsheathed green pair of a dissected CAT5e cable) to the solar input, and noticed it got hot near the solar socket on the wall. High current was flowing where high current was not planned for or expected, and the wire’s insulation had melted! How that happened, I’m not quite sure. 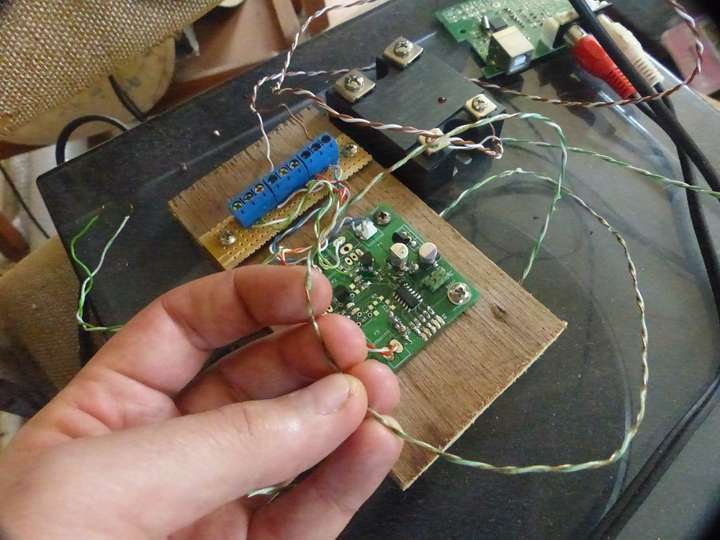 I got some side-cutters, cut the wires at the wall-end of the patch cable and disconnected the power controller. I’ll investigate it later. With that rendered safe, I disconnected the mains charger from the battery and wound its float voltage back to about 12.2V, then plugged everything back in and turned everything on. Things went fine, the solar even behaved itself (in-spite of the melty fuse holder on one panel). Last night, I tore down the old fuse box, hacked off a length of DIN rail, and set about mounting the new holders. I had to do away with the backing plate due to clearance issues with the holders and re-locate my isolation switch, but things went okay. The re-located isolation switch has left some ugly holes, but we’ll plug those up with time (unless a friendly mud wasp does it for us). 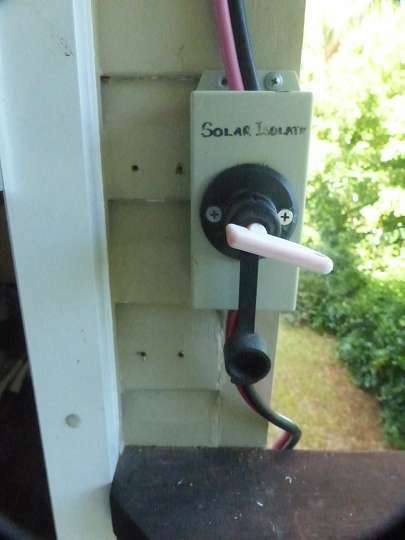 Solar isolation switch re-located, and some holes wanting some putty. For interest’s sake, this was the old installation, partially dismantled. You can see how the holders were mounted to that plate. The holder closest to the camera has melted rather badly. The fuse case itself also melted (but the fuse is still intact). The new holders are rated at 690V AC, 30A, and the fuses are rated to 500V, so I don’t expect to have the same problems. As for the controller, maybe it’s time to retire that design. The high-power DC-DC converter project ultimately is the future replacement and a first step may be to build an ATTiny24A-based controller that can poll the current shunt sensors and switch the mains charger on and off that way.